They rise very early; at about four thirty in the morning to have a leisure cup of coffee and wake up. It is still dark outside. They know to dress warmly since it will be still chilly when they head out to the beach this morning. They don their favorite, “lucky” sweatshirts. His is a tattered, old Seahawk sweatshirt with the sleeves cut off at the the three-quarter length. She puts on a grey sweatshirt that reads, “I fish; therefore I lie.” with a silhouette of a person with their arms extended out from the shoulders as if measuring something – like a fish. With their cups of coffee finished, they gather their gear. 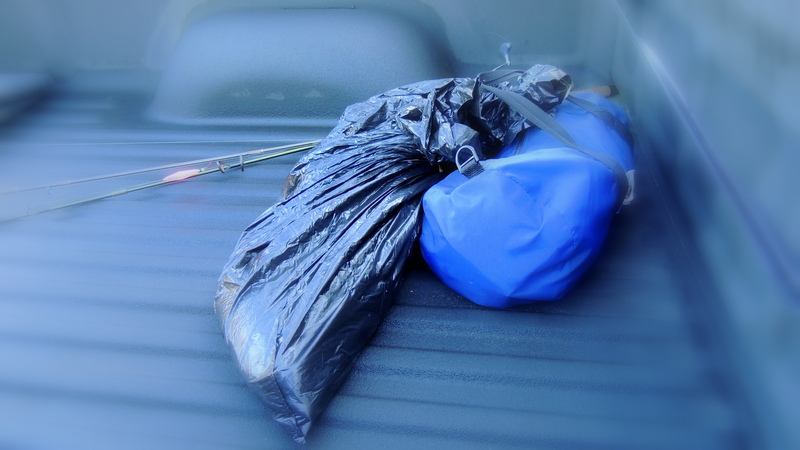 There is the small, dark blue dufflebag with specific tackle, tools, a fillet knife, spoon, large plastic bags, towels and water. There are two pairs of black, rubber boots for keeping legs and feet dry. His pole is a salmon pole, rigged with a 2 1/2 inch Buzz Bomb on braided seven pound test line. Hers is a small Gatorback trout pole, rigged exactly the same. These items are loaded into the back of the truck. Both of them check that they have their licenses because without it, if caught, the penalty is stiff; a hefty fine and loss of all gear! The dawn breaks as they load up and head out to the beach; their favorite beach. Making their way down the road, the sun has risen just enough to shine directly into their eyes. It’s a spectacular, crisp morning. Not too chilly but not too balmy. It rained the night before which is a very good thing. Fish tend to be very active following a rain. What fish? Well, Coho Salmon! They are running through the Puget Sound, making their way toward the rivers they were born in. It’s mid-September and the bite has been on! As they approach the beach, the anglers make a little bet about how many other anglers are currently on the beach. He says fifteen and she says eight. Dropping down and negotiating the hairpin turn, they learn that he is the winner of that bet (the ante was a special favor). Even at just after sunrise, there are at least fifteen anglers up and down the beach! With the truck parked, they change from shoes to boots, grab their gear and make their way to an open spot on the beach. Both dangle blue towels from the front left pocket of their jeans. The lures are duly coated with herring ‘smelly jelly.’ Does it really work? Probably not but the psychological assurance is all that is necessary. They begin the ritual cast and retrieve of salmon fishing from the beach. They fish side by side. Anglers all up and down the beach! On her third cast, something hits her lure but she is convinced she’d probably snagged her hook on some kelp since the kelp beds on this beach are pretty thick. Just down the beach, both notice another angler reeling in a fish! Not long after landing that fish, the same angler lands another one! Well, his limit is met. The regulations dictate that anglers can only keep two Coho salmon. So, the fisherman cleans his catch, breaks down his fishing rod and leaves. That spot seems very productive and is open! Seizing the opportunity, he makes his way over to that spot while she continues casting at the spot where she had been. After a while, she decides to pull in her line, gather the gear bag and head over his way to that very “fishy” spot left by the other angler. Gear placed safely on some driftwood high on the beach, she resumes casting just to his left. In just a short while, he has a fish on! TIGHT LINES! She pulls her line in and carefully sets her pole up on some driftwood to keep sand out of her reel. She runs to assist in landing his fish. He pulls the fish up on the beach and she, with blue towel outstretched, tackles the fish! He has a solid piece of driftwood stuck in his back pocket and uses it to quietly put the fish out of its misery. She hands him his fish and goes back to her pole to resume casting again. He documents his catch on a catch record – we must document right away should a fish checker come by! With the fish bagged, he grabs his pole and begins casting again. They both are casting into this magical spot. He casts out far. He always casts much further than her. She casts playfully close to where he’d cast when suddenly his line goes taut! He’s got a fish on, or does he have her line? Then, her line goes taut, too! Are their lines crossed? No! They BOTH have fish on! It’s a DOUBLE CATCH! This hasn’t happened for them in several years! Both are fighting fish at the same time!!! What a blast! Simultaneously, they both land their fish, still them and then bag them. He’s done now. He has his limit of two. She goes back to fishing. Casting and retrieving…..casting and retrieving…. It’s not very long before she has a fish on! She tells herself not to ‘horse’ the fish! Finesse is the name of the game! Keep the rod tip up and high!!! Keep the line tight! Follow the fish! Play the fish! The fish runs at the beach! She’s reeling and backing up as quickly as possible, trying to avoid the flotsam scattered on the beach as trip hazards. The fish comes up on the beach and he is there to assist her! He looks at the fish and declares that it is pretty small. These anglers are benevolent, unselfish anglers. If the fish is small, they are returned to the sea. So, back this one goes to grow up some more, hopefully. More casting and retrieving. She notices that her hook is hanging weirdly and tries to straighten it. She notices that the knot is looking weary and frayed a little. Concerned but no so much that she stops fishing, she casts again! Another hit! The fish flips and jumps out of the water! It runs a little and then – TINK! – the line goes seriously slack. There is NO drag on retrieval, this time. The knot gave! The lure is gone! He is the line rigger extraordinaire! So, she takes her pole to him to have him rig it with a new lure. Expertly, he completes the task quickly and she is back to fishing. Cast and retrieve…..Cast and retrieve…..Cast and TIGHT LINE! Fish on!!!! She plays the fish to the beach and brings it up on the sand. He grabs it and says that it is another small one. They almost return this fish back to the water when he notices that the hook has seriously injured this fish. It won’t survive. A quick couple of whacks to the head of the fish and it is silenced. She now documents HER catch. The fish is bagged with the other one. With four fish in the bag, they gather their gear to go home. It is barely nine o’clock. Not a bad start to a day, wouldn’t you say?